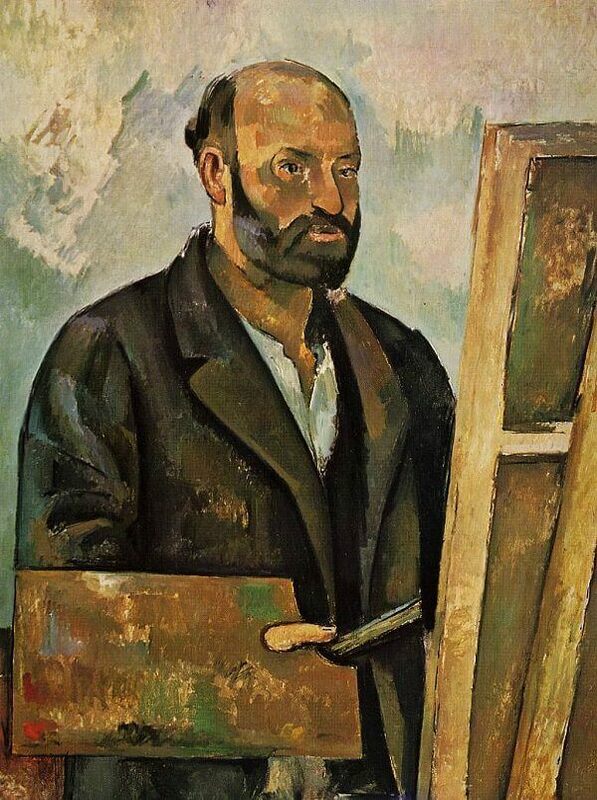 Cezanne's Self Portrait with Palette, 1885 is the most impersonal self-portraits we know - and not simply because the face and especially the eyes are unfinished. The painter stands behind his easel and palette, assimilated to their lines even in small details. The rectangle of the canvas is felt within everything it contains; the head and body are rectangularized and framed by the palette and easel. The color of the head is very close to their tones and to the jacket. Within the broadly rectangular face, the inner edge of the hair and beard is curved like the rounded corner of the palette; the indentation of the beard on the cheek corresponds to the outline of the thumb on the palette, and to the notch of the lapel. The most human element is bound to the non-human and both are stable and constrained. This bond reaches its extreme in the surprising continuity of the vertical edge of the palette and the sleeve, which seem to form one body, parallel to the frame. (Similar is the ending of the tips of the brushes at the line of the coat.) The normal, irregular overlapping of things has given way to a constraining form. Submitted to the same strict, closing pattern, these carefully realized objects assume an air of artifice and abstraction, like the diagram of a building plan. Yet the whole is intensely objective and monumental, with a stony strength of modeling in the limited depth between the palette and the wall. The lower left corner - a reddish table - has the flatness and severity of a Cubist work. This rigorous and forced cohesion is what the Cubists admired, among other things, in Cezanne and carried further in their own art. The palette continuous with the body appears in an early self-portrait of Picasso. A purely formal interpretation is hardly just to the expression of the painting. The devices mentioned not only reduce the depth and adapt the picture to the rectangle and surface plane of the canvas. They carry also an affect of self-isolation in forms that otherwise advance boldly into the spectator's space. Cezanne comes forward here, more than most painters would venture in a self-portrait; but he does not face the observer or move freely in space. Concentrated on his canvas, he is absorbed in the closed world of his own activity. The palette, with its naively objective form, unforeshortened and attached to the painter's body, is a barrier against the outer world. If the palette projected towards us, it would create a convergent shape, drawing us more rapidly into the depth of the picture. In their actual form, the palette, the head, the body, and easel are analogous patterns of stability and detached existence, all adapted to the ideal rectangle of the picture, a closed plane surface. The color, too, is a vehicle of this conception, but expresses also within these limits the undercurrents of impulse and self-release in the solitude of the artist. Cool, subdued, and severe, and dominated by the rare blue-black of the costume and beard, it ranges from the most vigorous contrasts of modeling, as in the powerfully painted coat, to the beautiful patching of the palette and the free, Iyrical effect in the delicate landscape tones of the background, which contains the colors of the solid objects in a vaporous state.